On 28 November 2019, world-class road marking technology specialists will convene for this year’s HOFMANN Technology- Day. For the 21st time, the global player HOFMANN Road Marking Technology invites high-level trade professionals from all over the world to its company site in Rellingen, Germany. In doing so, this family company cements its positions as the home and innovation centre of the industry. Humans are thinking. Who is steering? Would you like to become an exhibitor? Please register here. 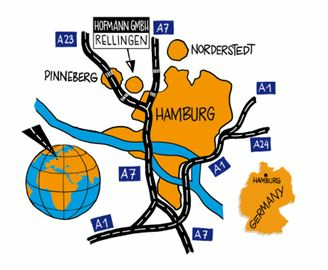 From south: Take A7 (E45) to Flensburg / Kiel, change to A23 to Husum / Heide, exitHalstenbek-Krupunder / Rellingen Süd. Turn right to Industriegebiet Rellingen Industriestrasse / Hermann-Löns-Weg, approx. 200m after the next crossing turn right into Hermann-Löns-Weg. After approx. 1 400m turn left into Industriestrasse (oneway). You will reach our building after the second bend. From north: Take A7 (E45) to Hamburg / Hannover, after exit Schnelsen change to A23 to Husum / Heide. Leave motorway at exit Halstenbek-Krupunder / Rellingen Süd. Go on like a.m.